Hust CNC simple basic G-code program example, which shows the difference between G90 Absolute Coordinate & G91 Incremental Coordinate. This tutorial also applies on most Fanuc cnc controls as well. This is a good resource for beginner level cnc machinists and cnc programmers to understand the difference between G90 and G91. G91 G Code is used for Incremental Coordinate. The origin (Workpiece Zero Point) is the reference. The coordinates of all points describing the shape of the work-piece (machine part) are calculated from the origin. 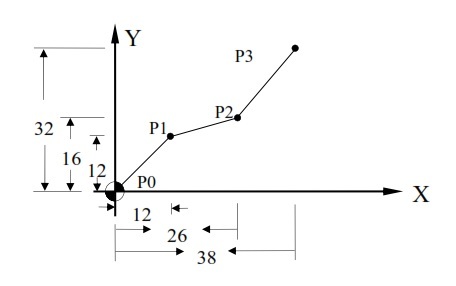 The coordinates of all points describing the shape of the work-piece (machine part) are calculated from the end point of the previous block. X is used for X-axis Absolute movements. Y is used for Y-axis Absolute movements. Z is used for Z-axis Absolute movements. U is used for X-axis incremental movements. V is used for Y-axis incremental movements. W is used for Z-axis incremental movements. So in short if you are working in G90 Absolute Coordinate mode then if you wish you can make Incremental movements by using U, V, W.
So there is no need to use G91 Incremental Coordinate command G-Code. X is used for X-axis Incremental movements. Y is used for Y-axis Incremental movements. In G91 Incremental Coordinate mode U, V, W cannot be used.